Hi there! Today I’m sharing a review for a new magical M/M romance from the historical Charm of Magpies world conjured by KJ Charles. 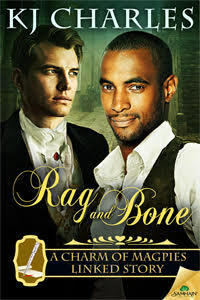 RAG AND BONE marks the beginning of a new series and features an interracial couple who’ve got some true dilemmas. As you know I simply loved A GENTLEMAN’S POSITION, THINK OF ENGLAND, and THE SECRET CASEBOOK OF SIMON FEXIMAL, so I knew I’d love this historical, magical romance. Crispin is a disgraced warlock attempting rehabilitation. He had no idea when he was recruited, as a child, by a blood magician that he was doing anything illegal. It was only when his mentor and caretaker was found guilty of murder that Crispin’s involvement became known. He’s been offered several mentors to re-train him in acceptable use of magic–and has failed all attempts, his magic–graphimancy–simply doesn’t work like other types. Using his forbidden bone pen (fashioned from one of his own finger bones!) Crispin can draw with his own blood and make magic happen. It’s a bit harrowing, and highly frowned upon. It’s a fantastic mystery, and a sweet romance. This book is the first in a spin-off series from the Charm of Magpies, and fully enjoyable on its own–though I will admit to rushing back and buying up the Charm of Magpie books. I’ve not read a book by this author that I haven’t thoroughly enjoyed, so it’s not a big gamble. Interested? You can find RAG AND BONE on Goodreads, Samhain Publishing, Amazon, Barnes & Noble, and AllRomance.